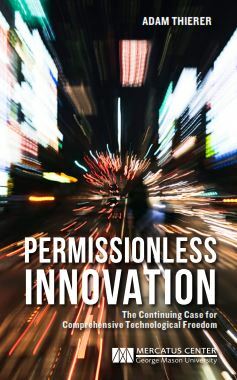 I am pleased to announce the release of my latest book, “Permissionless Innovation: The Continuing Case for Comprehensive Technological Freedom.” It’s a short manifesto (just under 100 pages) that condenses — and attempts to make more accessible — arguments that I have developed in various law review articles, working papers, and blog posts over the past few years. I have two goals with this book. The central lesson of the booklet is this: Living in constant fear of hypothetical worst-case scenarios — and premising public policy upon them — means that best-case scenarios will never come about. When public policy is shaped by precautionary principle reasoning, it poses a serious threat to technological progress, economic entrepreneurialism, social adaptation, and long-run prosperity. If you’re interested in taking a look, you can find a free PDF of the book at the Mercatus Center website or you can find out how to order it from there as an eBook. Hardcopies are also available. I’ll be doing more blogging about the book in coming weeks and months. The debate between the “permissionless innovation” and “precautionary principle” worldviews is just getting started and it promises to touch every tech policy debate going forward. “The Growing Conflict of Visions over the Internet of Things & Privacy,” Technology Liberation Front, January 14, 2014. “CES 2014 Report: The Internet of Things Arrives, but Will Washington Welcome It?” Technology Liberation Front, January 8, 2014. “Edith Ramirez’s ‘Big Data’ Speech: Privacy Concerns Prompt Precautionary Principle Thinking,” Technology Liberation Front, August 29, 2013. “When It Comes to Information Control, Everybody Has a Pet Issue & Everyone Will Be Disappointed,” Technology Liberation Front, April 29, 2011. “Copyright, Privacy, Property Rights & Information Control: Common Themes, Common Challenges,” Technology Liberation Front, April 10, 2012.